We use the complete Adobe suite including Illustrator, Photoshop and Acrobat for creating customized branding solutions. If you have a website, we will help you come up with the perfect header, sidebar and background image design. Our professional graphics team can help you create the right logo and slogan for your site using advanced layering and typology. Every letter and pixel will be placed on each page in a way that best represents your business or organization. We can produce color copies of just about any digital file you own, or we can make a copy of your print materials. In addition, we can put our creativity to work and design you full-color business cards, brochures, window and vehicle graphics and more. The most important aspect of creating promotional content is that it all should be consistent with one another. Therefore, we recommend that you create all your social media pages, websites, printed literature, T-shirts and other products with the same branding logo. We can help you set all of this up and take all the hard work out of increasing the recognition of your brand. Let us know what your business mission statement is, and we will help you create the right logo design. We have access to hundreds of color combinations to make sure that we use the right shades for your business. 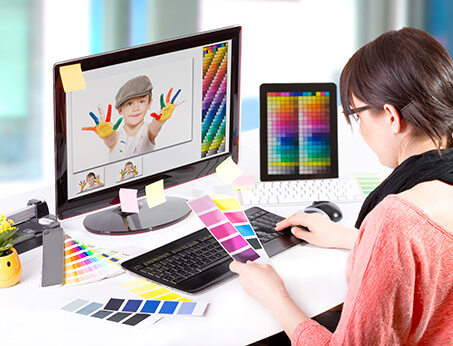 Furthermore, we can make your website-safe colors match what is on your printed material.